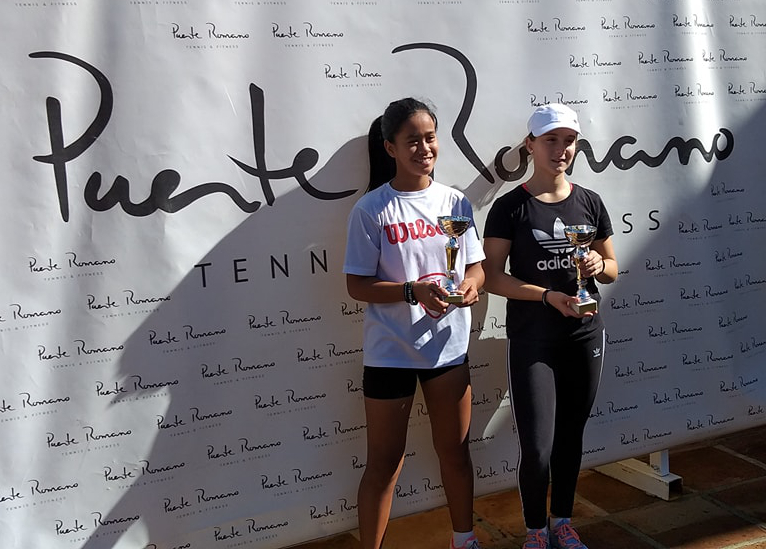 This weekend Jeannie Barcia became the champion at the XXII Circuit de Tenis Costa Del Sol 4th tournament which was held at the Riviera Sport Club in Marbella. The tournament was for players aged 14 and under. Jeannie, seeded number 1, progressed through the opening rounds to reach the final against the number 2 seed Laura Mañas. The final was a very hard fought match lasting 2 hours and 15 minutes. Both players have excellent forehands, Laura’s forehand is very hard hitting and Jeannie’s forehand and backhand drive are both very consistent. Jeannie pushed hard from the centre and baseline, there were many passing shots but Laura defended very well. It was a very exiting match right to the finish. The final score was: 6-1 6-4 to Jeannie. 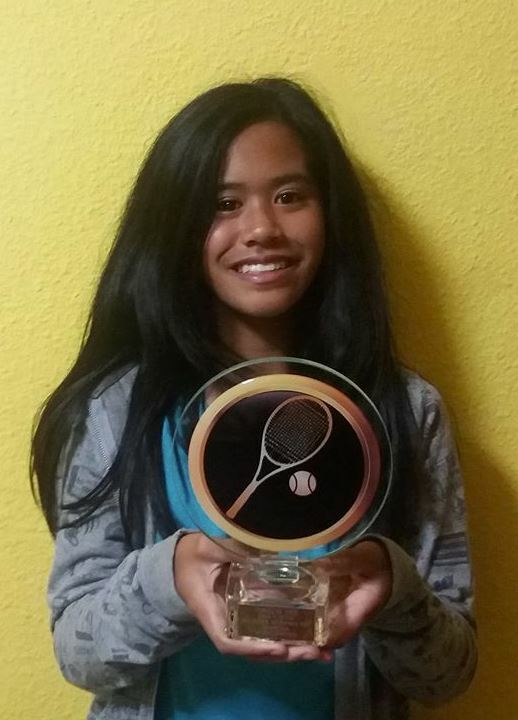 You can help Jeannie achieve her dream of becoming a professional tennis player. Please follow at: support-jeannie.com. 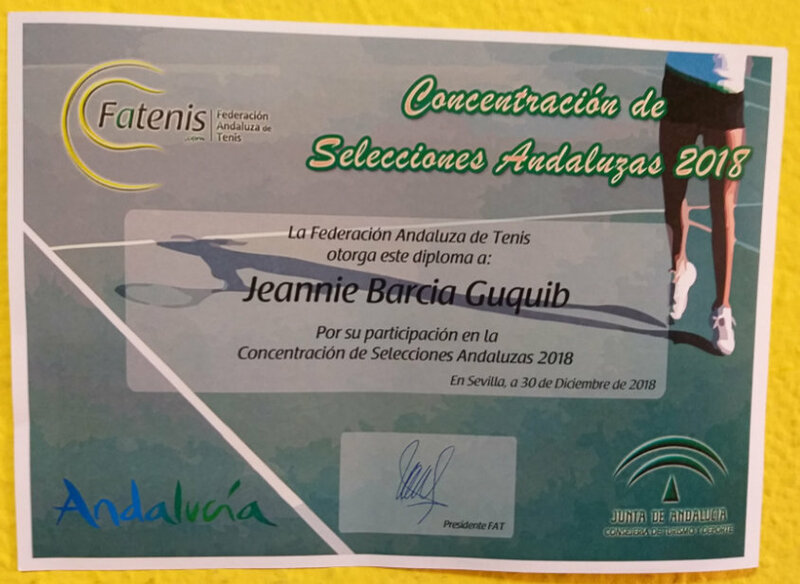 We are delighted to report that Jeanie Barcia was selected by the Andalucian Tennis Federation to be one of the players to represent Andalucia in the 14 years and under age group. 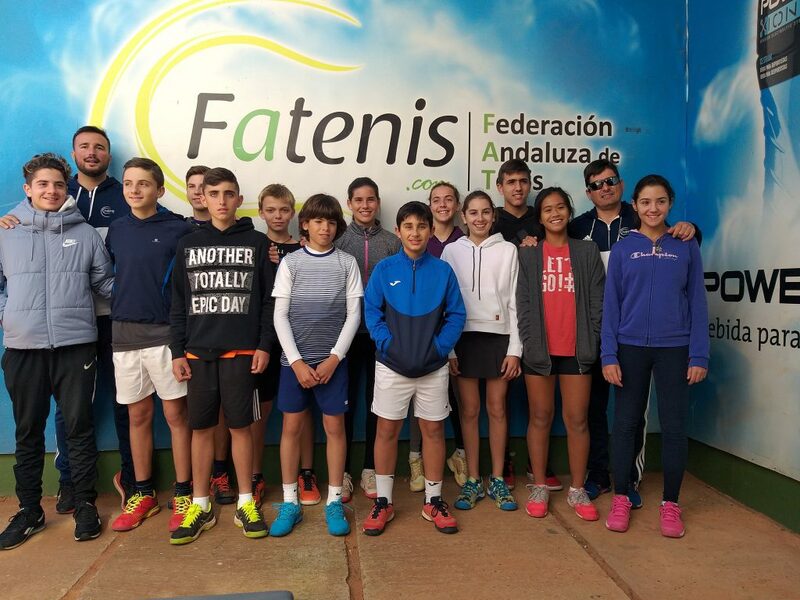 Jeannie took part in a three day intensive evaluation in Seville, where the Federation staff coaches monitored the skills and abilities of the candidates. On the 30th December Jeannie was presented with a diploma confirming her selection. 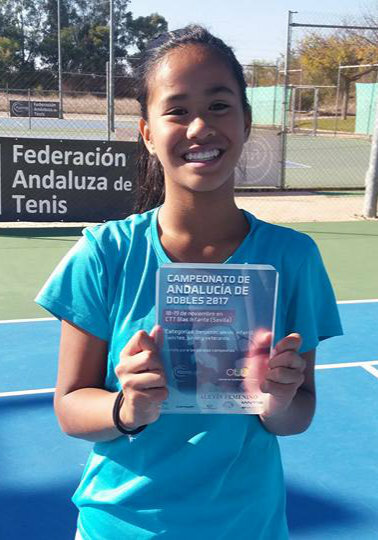 Jeannies coach and Father, Orlando Barcia, said “In future regional tournaments Jeannie will now represent Andalucia in her age group. She was told by the federation coaches that she would make a first‑class tennis player if she can continue her career. Unfortunately, there is no sponsorship with this opportunity, but we will continue to try and realise her dream for as long as we can“. Thirteen year old Jeannie Barcia added yet another trophy to her growing collection. 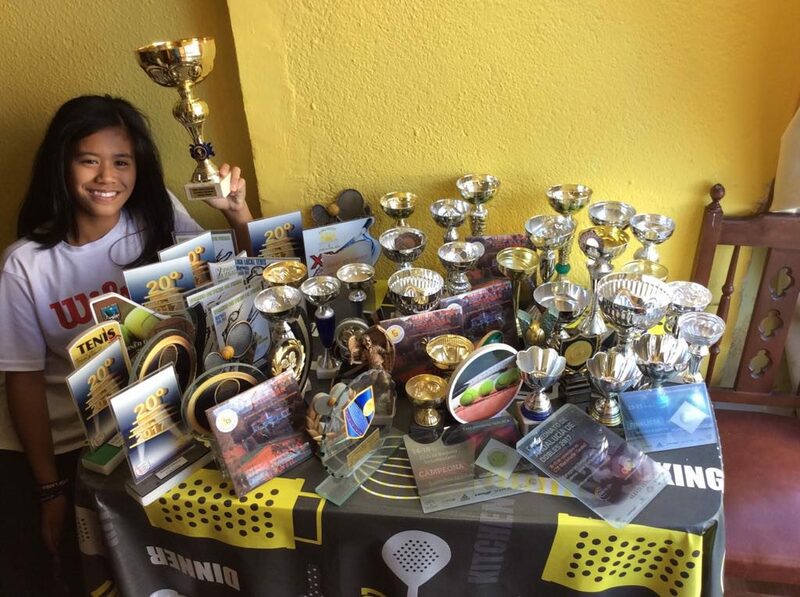 Last weekend she battled through to become runner up in the XV TORNEO FEDERADO CLUB DE TENIS PUENTE ROMANO. This federated tournament counts towards the rankings on a regional and national level for all participants by age category. Jeannie was competing in the 14 years and under category. In the semi-final match Jeannie was up against Semona Alter, a tough competitor. Semona is physically very strong with a good serve, she plays well from the baseline and her forehand and backhand strokes are consistently good. The match was scheduled for 20.00 pm and watching the warm-up one could see that it would be a tough match. The first game of the first set was very long and was finally won by Simona. However, Jeannie remained calm and took the next game to level the score at 1-1. From then on the match was played like professional players, every point was fought hard with many strong cross-court exchanges and down the line winners. Jeannie finally took the first set 6-3. The second set was even more strongly contested. Every point was a struggle but Jeannie’s big forehand drive started to come into play. If Jeannie received the ball in the centre of the court her forehand was very solid. The intense and exciting atmosphere of the match drew a large crowd with many players and trainers watching the game. Jeannie finally won 6-3 6-4 in a match that lasted two and a half hours. The next day the final took place at 10.00 am, Jeannie’s competitor was the other semi-final winner Telma Lorenzo. Jeannie lost the final 2-6 3-6. The match was very different to the semi-final with some line-call disputes and Jeannie didn’t settle and made too many unforced errors. These two matches were very different and are an example of different ways of winning and losing. They provided a great experience for young players like Jeannie to develop their game. This will be the first time that Jeannie has participated in an international tournament and she needs all the help she can get. The Juan Fuster Zaragoza tournament is for under 14 junior tennis players and takes place at the Club De Tenis “Lope De Vega” in Benidorm, Alicante, during the week of 28th August 2018. This is an important tournament for Jeannie and her coach father Orlando, it will be a new experience for Jeannie as she chases her dream of becoming a professional player. 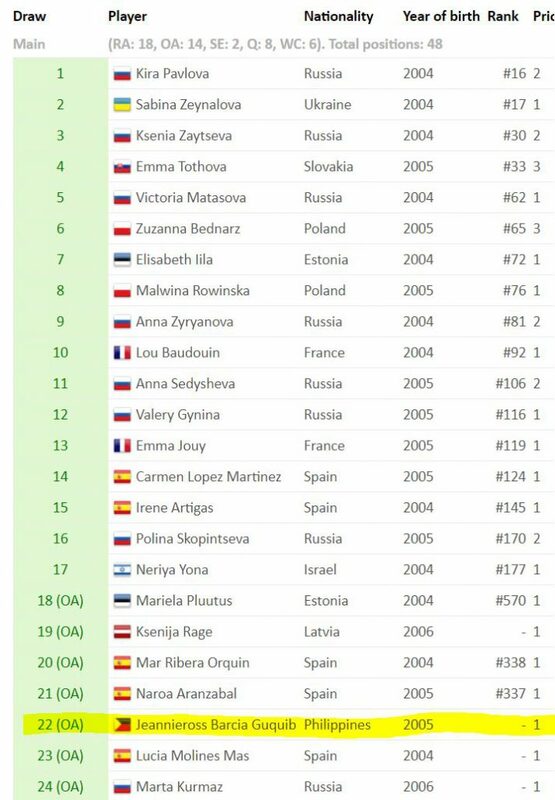 Jeannie’s recent tournaments have been at the Rafa Nadal Tour in Madrid where she reached the quarter finals and then at the beginning of August Jeannie reached the finals of the under 16 XXI Circuito Andaluz de Verano. It is difficult for Jeannie to compete in many of these tournaments without raising some funding. For example, the cost of competing in the Rafa Nadal tournamant in Madrid, including the hotel, entry fee and travel was around 700 Euros. Ironically, the more successfull she is, advancing to the next round, the more expensive it can be, having to pay for extra nights in a hotel. How can you help Jeannie? A fund raising campaign has been launched to help Jeannie Barcia reach her goal of becoming a professional tennis player. Almost every week, Jeannie has to travel and compete in tournaments across Spain against players with far more finacial resources. Without competing in tournaments it is not possible for Jeannie to gain points to increase her ranking. You can find out Jeannies latest ranking in Spain by clicking here. How can I help Jeannie? In order to spread the word, a number of postcards have been produced in English, Filipino and Spanish. A postcard will be sent to anyone who helps Jeannie with a donation. Jeannie Barcia was in action once again, appearing in this weekend’s tournament at The Royal Tennis Club in Marbella. Jeannie fought through to the final and was the runner up in the X1 championship, 14 years and under class. Jeannie has had plenty of success this year in both, the 14 year and 16 year and under categories, and sometimes it’s worth remembering that she is still only 12 years old. Her future is looking very good. To be able to keep doing well in tournaments, every day, Jeannie has to put a lot of hard work into her training. For this weekend’s tournament Jeannie spent a lot of time with her tennis coach (and Father) Orlando developing and practising her double handed backhand. 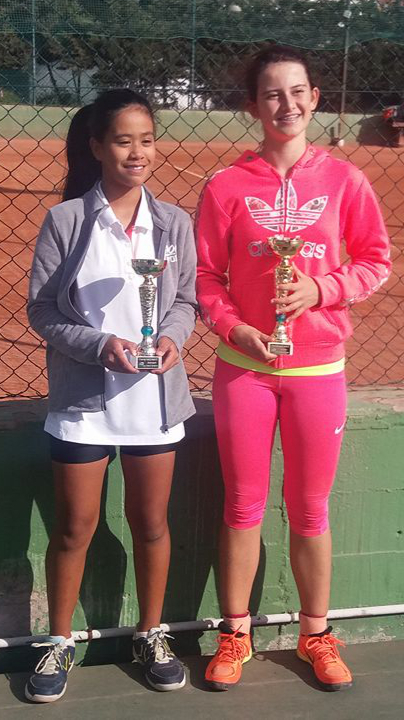 In a great weekend of tennis, Jeanine Barcia and Paula Moreno triumphed to become this year’s Andalusian Under 12 Doubles Champions. On Saturday, Jeannie and her partner Paula have an emphatic win, overcoming their opponents in straight sets: 6-0, 6-0. Early Sunday morning, their opponents for the semi-final were Laura Villanueva and Udvardy Luca. Both Laura and Udvardy are strong players with a good reputation, so this was always going to be a hard match. Jeannie’s Marbella tennis coach, her dad Orlando Barcia, was looking on nervously. However, once the match started Jeannie is showing a lot of confidence, hitting strong forehand and backhand shots. Her partner, Paula, is also playing very well, consistently keeping the ball in play. This helps Jeannie to take advantage, and with great down-the -line and passing shots, they take the first set 6-1. At the start of the second set their opponents are playing very well hitting strong forehands and the match gets exciting and really comes alive. Even with the rule of single point deuces (sudden death at 40 all), the games were long and hard, sometimes lasting 10 minutes long. In a great match, eventually, Jeannie and Paula triumphed 6-1, 6-4. 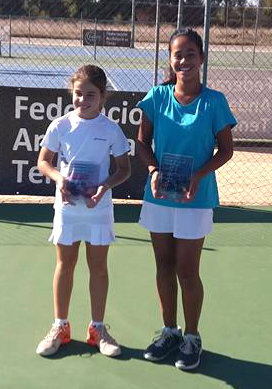 The final match was against the tournament number one favourites, Claudia Camuñes and Christina Mateos, these two players are the number one under 12 doubles players in Seville. The outcome of the final was a big surprise as Jeannie and Paula played very well from the start with some very strong stroke play. The top favourites couldn’t recover to fight back and Jeannie and Paula pulled of an exciting win to take the championship. The final score was 6-1,6-1. It has been a good couple of weeks for Jeannieross Barcia that have culminated in a great performance at the Andalucian Regional Under 13 Championships. Jeannie has had some tough matches, having to first qualify and then battling to reach the semi-final on the final weekend of the championship. 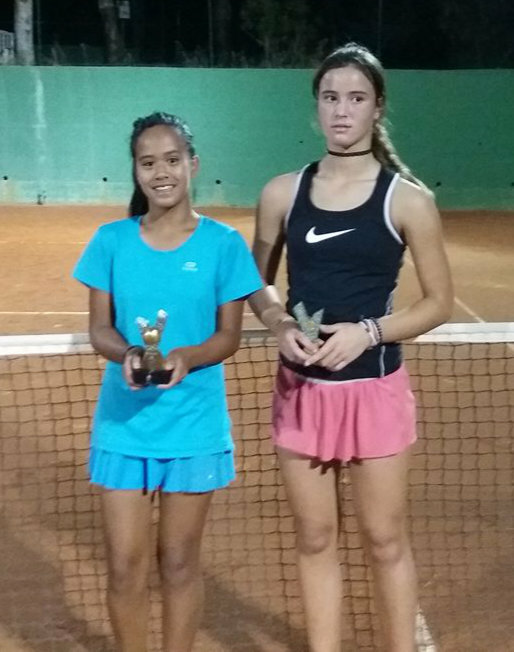 But first of all, on the 21st October Jeannie also became under 16 champion at Polideportivo San Pedro Alcántara Marbella. On 22nd October Jeannie won the first qualifying match 6-0, 6-0 to go forward to the final draw. In the final qualifier against Dana Aylan, a consistently good player, Jeannie played an almost perfect game with confident passing, forehand down the line and cross-court shots. The final score was 6-1, 6-0, a great result and Jeannie went through to the final 16 playing the next weekend. On 28th October Jeannie played two matches, she won the first match against Claudia Garcia Jimenez ranked number 4. It was a really exciting game taking 4 hours and the final score was 7-6, 3-6, 6-3 taking Jeannie into the quarter finals. In the quarter finals Jeannie won again 6-3, 6-3 becoming the first Filipno to make the regional semi-finals. On the following day Jeannie played in the semi-final and, although she lost, gained great experience at playing in a regional championship at a high level. 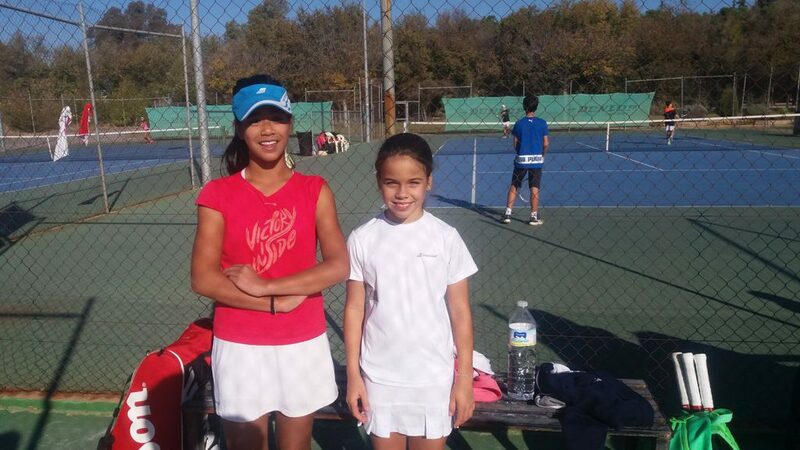 Jeannie is coached by Marbella tennis coach Orlando Barcia who runs tennis lessons in Marbella. 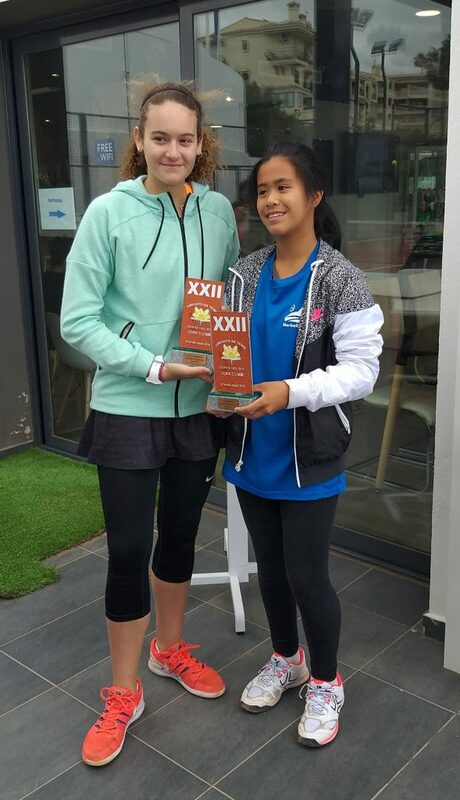 Jeannie Barcia became the under 14 champion of the X11 tournament at the The Royal Tennis Club this weekend. After a marathon semi-final match, that lasted for two hours and forty five minutes, against Sofía Marinesco, a strong player with a hard hitting forehand and backhand top spin. After losing the first set 4-6, Jeannie used her powerful forehand and backhand drives to take the second set 6-1. The match then went into a super tie-break which Jeannie, now full of confidence, won (10-5). During the match Jeannie fell three times whilst trying to return very difficult balls, it was a very emotional match. The final was against Maria who was physically taller than Jeannie with powerful serves, forehands and backhands. However, Jeannie, full of confidence after the semi-final, won the championship after a good match.